Senegal's Casamance region was once the breadbasket of this West African nation, known for its rich vegetation, biodiversity and expansive forests. But these woodlands are rapidly disappearing, forming a silent crisis that has now reached a critical level. In a region where climate change poses a serious threat, this loss spells long-term disaster. To date, Casamance has lost over 10 000 hectares of its forests to illegal logging, representing an estimated 1 million trees. The Casamance forest area covers 30 000 hectares and is known for its rare tree species. This includes rosewood, which is particularly high in demand in China. In May 2017, a prominent Senegalese ecologist and former minister of environment, Haidar el Ali, warned that 'within two years, there will be no more forests in Casamance'. An extensive network of actors has been cashing in on large-scale illegal logging and timber trafficking in the region. These include armed groups, Senegalese and Gambian businessmen, foreign actors (particularly from India and China) and also the local population. The Movement of Democratic Forces of Casamance (MFDC), a separatist group that has been fighting for the independence of the Casamance since 1982, sustains itself largely through timber trafficking. The past decade has also seen increasing involvement by Chinese actors, who are reported to operate largely in northern Casamance, along the Gambian border - and to a lesser extent along the southern borders with Guinea-Bissau. Their involvement has been linked to the huge demand generated by China's rapidly developing wood industry. Businessmen established in the Gambian capital of Banjul are reported to ship the precious wood smuggled from the region to China. However not all the logged timber is exported. A significant portion also feeds local markets in both The Gambia and Senegal. In 2016, el Ali made headlines by posting drone footage showing tons of tree trunks in Sare Bodjo, a Gambian village near the Senegalese border. The timber had been stacked, ready to be loaded onto trucks headed to the port of Banjul, from where it was to be shipped to China. After Nigeria, The Gambia is West Africa's second largest exporter of timber to China. Between 2010 and 2015, the country's export of rosewood to China was worth an estimated US$238.5 million. This is a staggering volume, especially since The Gambia has almost no remaining forests. This might suggest that much of the timber exported to China comes from Casamance. In response to the scourge of illegal logging, Senegalese President Macky Sall reiterated in January 2018 a policy that was first announced in May 2015 to suspend the issuing of permits for woodcutting in the region. More recently, on 2 November 2018, a new forest code was adopted by the National Assembly. Despite all the measures that have been put in place, illegal logging in Senegal is still rampant. This is likely to continue, given that responses have been insufficient. The logging ban itself is also problematic. It is limited in scope, as it only applies to the Casamance region (Ziguinchor, Kolda and Sédhiou). The enforcement of the ban is not properly monitored, either. According to the head of the village of Niombato, African mahogany continues to be felled by the ton in the surrounding forest. A high-ranking Senegalese official, who spoke on condition of anonymity to the Institute for Security Studies' ENACT organised crime programme, confirmed that the situation had not changed. According to the official, measures have only resulted in a recircuiting of smuggling routes. 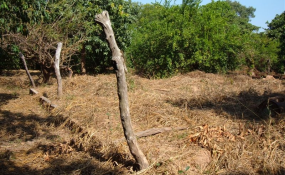 ENACT research found that former Gambian president Yahya Jammeh had for many years decimated a large part of the Casamance forest. The timber was traded through a shell company, Kanilai Group International. His departure heralded a new chapter in the fight against illegal timber trafficking, and enabled the Economic Community of West African States (ECOWAS) military intervention in The Gambia to step into the fight. Dozens of timber trucks reaching The Gambia from Casamance have already been impounded. The leadership of both countries should seize this opportunity and collaborate to stop the illicit trafficking of timber. The Senegalese government should also cooperate more closely with Guinea-Bissau to track down and arrest traffickers. It is up to not only the Senegalese government, but also local populations, to reverse illicit logging and timber trafficking. Resolving the Casamance conflict is key, as are efforts to increase surveillance and security in the forests. Senegalese authorities should continue to improve socio-economic conditions and prospects for Casamance's youth. Most importantly, the government must address the issue of graft, particularly by empowering anti-corruption bodies in partnership with dynamic civil society organisations.